Heart & Soul Hospice provides nursing care in various settings. Whether you reside in your own home, a health care center, an assisted living community or a hospital, we are committed to providing the highest level of comfort and care. We work diligently to put the unique needs of each patient, caregiver and family unit at the center of all decision making. This focus ensures the needs and wants of each patient are met. Our nurses work in collaboration with other health providers (such as physicians, social workers, or chaplains) as part of an interdisciplinary hospice team to serve our patients and their families. Your Heart & Soul Hospice nurse serves as a case manager and advocate for you or your loved one. Their job is to monitor vital signs, manage medications, and take care of the needs of the patient in a holistic approach. Nurses and hospice aides provide patient and family education on care-giving and end-of-life issues. Heart & Soul Hospice nurses are available 24-hours a day, 7 days a week to patients and their families. The Heart & Soul Hospice nurse’s main responsibility is to help people live as comfortably and independently as possible and with the least amount of pain, in their final days. We offer four different types of care, based on the patient’s needs. Routine Home Care – Ongoing end-of-life care provided to patients at home or in a health care center. 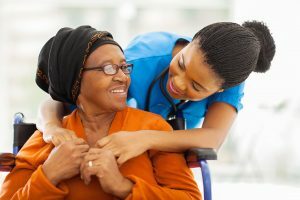 Continuous Care – Short-term end-of-life care provided by nurses and hospice aides to a patient in crisis to keep the patient at home as determined by a physician. Respite Care – Short-term stay (up to 5 days) in a health care center or hospital. General Inpatient Care – Temporary intensive care provided at a hospital or health care center to manage and control acute symptoms such as pain.